I have a feeling that I’m not the only one yearning for some sunshine, mild temperatures, and sing –songy birds flying by our open windows. I am truly a person who genuinely enjoys each and every season for what it brings. Growing up in the desert, I didn’t have much exposure to real, honest to goodness season changes like I do here in the Pacific Northwest. After nearly 5 years here, I still get excited for all the firsts of the seasons: each fresh burst of summer sun, each time I notice that the skyline has been taken over by the earthy, fiery colors of fall, every first winter morning when I realize I underestimated the cold and need to better bundle up against the frigid air, and for those first blossoms of spring. I’ve loved the madness of this year’s winter, but am ready to shed some layers and see some color peeking out from the earth. My fingers are crossed I’ll be able to enjoy this soon. In the meantime, I’ll eat this dish. Well, I already did eat this dish, but perhaps I shall do so again. Something about dill (one of my favorite herbs) reminds me of spring. It’s that punchy taste that sort of coats your palette and infiltrates all the senses that I love. 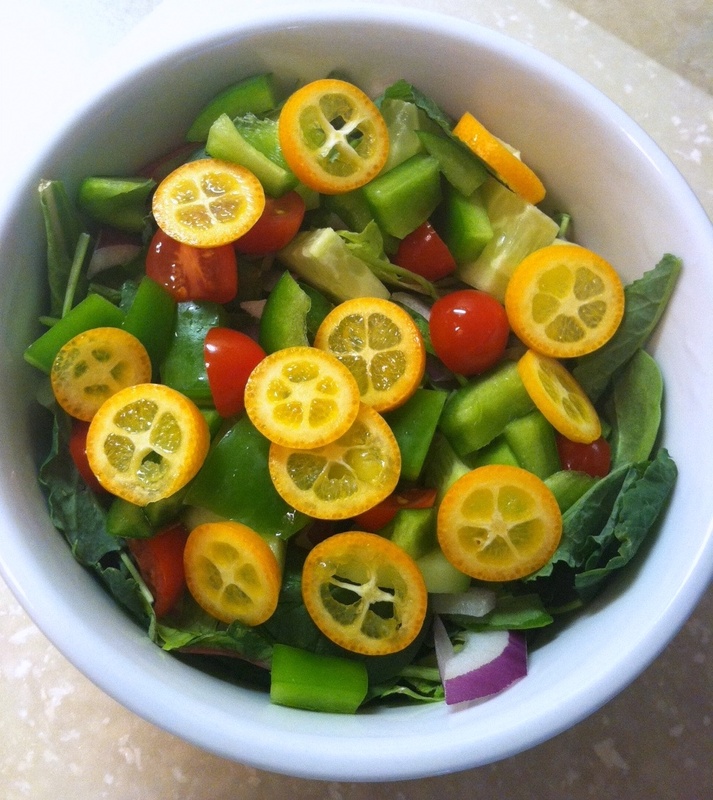 It tastes fresh and new and full of possibilities, just like spring does for me. Pre-heat oven to 350 degrees. Prepare a baking dish by coating with cooking spray or a light coating of oil. Set aside. Slice the tops of the peppers off and clean out the insides, removing veins and seeds. Place into a baking dish, cut side up and tops removed, and bake for 20 minutes. If the peppers are uneven on the bottom and will not stand up in your baking dish, you can even them out, by trimming the bottom edges (though be careful not to cut holes in the bottom, as the filling will leak out). After 20 minutes, remove from oven and set aside until filling is prepared. Meanwhile, warm a large sauté pan over medium heat. Add olive oil. When hot, add onion, garlic, and carrot to the pan. Cook, stirring occasionally, for about 5-6 minutes or until the onions turn translucent. Add zucchini and spinach to the pan and stir to combine. Cook for 2-3 minutes more. Finally, add the cooked rice, tomato paste, red wine vinegar, parsley, dill, salt, and pepper to the vegetable mixture. Stir well to incorporate all ingredients. Taste and adjust for seasonings. 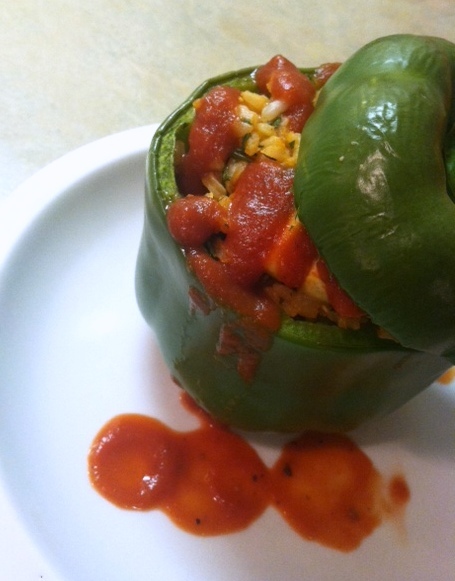 Spoon filling into the each partially cooked pepper base until full. Feel free to pack it in well – there should be plenty of filling! Carefully sit the removed tops back on to the peppers, place back into the oven (still at 350 degrees) and bake for 20-25 more minutes. Serve alone, or if you prefer, drizzle an easy sauce over the top. I served mine with a simple can of tomato sauce, sprinkled with oregano and pepper, warmed up on the stove top. I can’t believe that it’s the middle of November and I haven’t waxed poetic about fall yet. I haven’t even extolled the beauty of Portland this time of year or praised the glorious weather we’ve been having, because we absolutely have been having the most glorious season. We’re known for our rain and gray skies, of course, but they’ve been few and far between the last couple of months. It’s been perfect. Perfect for running and strolling. Perfect for sightseeing and adventuring. Perfect for autumnal baking and for hard apple ciders enjoyed while firing up the oven for a good meal. As cheesy as it may sound, I frequently find myself being struck by the beauty of the nature that lies right outside my door. Very often these last few weeks, I have been out on a seemingly ordinary run only to turn a street corner or look up from making sure I don’t trip over fallen branches and I have felt taken aback by just how gorgeous it all is. And, let me tell you, there’s nothing like a breathtaking view to rejuvenate tired legs. I know that it’s common for many people to think of spring as a season of rejuvenation and hope, but I think differently. For me, it’s that magical time between mid-September and December, when cooler temperatures refresh me and warm foods nourish me. It is this time of year when I feel the most in touch with my own sense of optimism, accomplishment, hope, and gratitude. I hope this dish conveys even a bit of that to you. 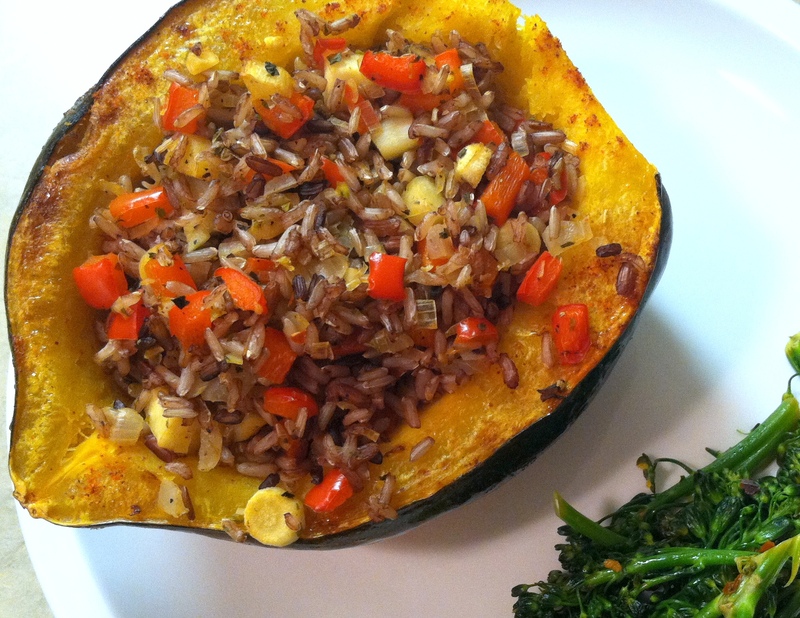 Stuffed squash recipes abound, but what makes this one a bit different for me is its straightforward savory nature. Rather than playing up the sweetness of the squash with fruit or similar ingredients, I’ve countered it with a bit of spice and bundles of warm, comforting flavors. It is a meal best enjoyed with a view of the leaves and the laughter of others. A crackling fire and a bottle of wine wouldn’t hurt, either. Preheat oven to 375 degrees. 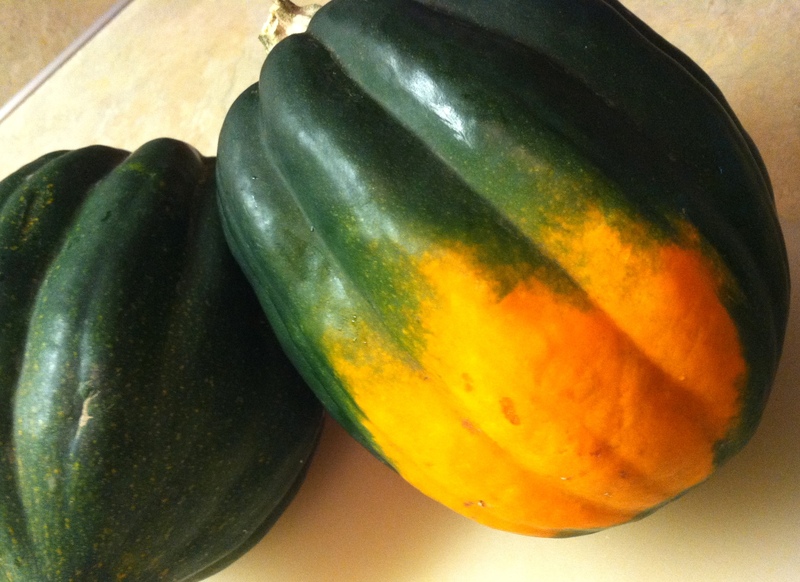 Place squash (cut side down) on a baking sheet lightly coated with cooking spray or oil and bake for 30 minutes. Place rice in a small pot with the water. Cover and bring to a boil over high heat. Once boiling, reduce to a low simmer and continue cooking, covered and undisturbed, for approximately 30 minutes or until all water is absorbed. When water is absorbed, turn off heat and let rice sit for 10-15 minutes before uncovering and fluffing with a fork. Warm ½ tblspn olive oil in a sauté pan over medium heat. Add onion and leek. Saute for 5-7 minutes, until they are translucent. Add garlic, bell peppers, parsnips, herbs, and spices to the pan. 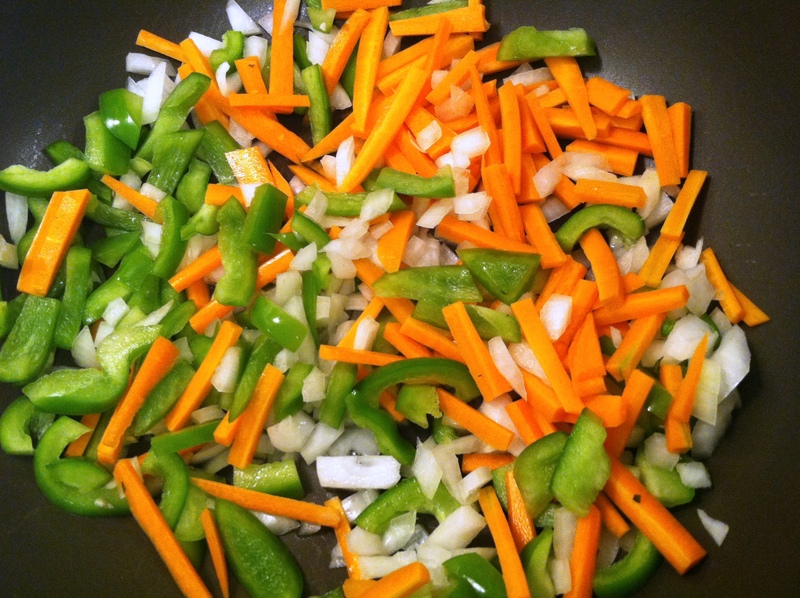 Stir well and continue to cook for 5-7 minutes, until all vegetables have softened. Turn off heat. 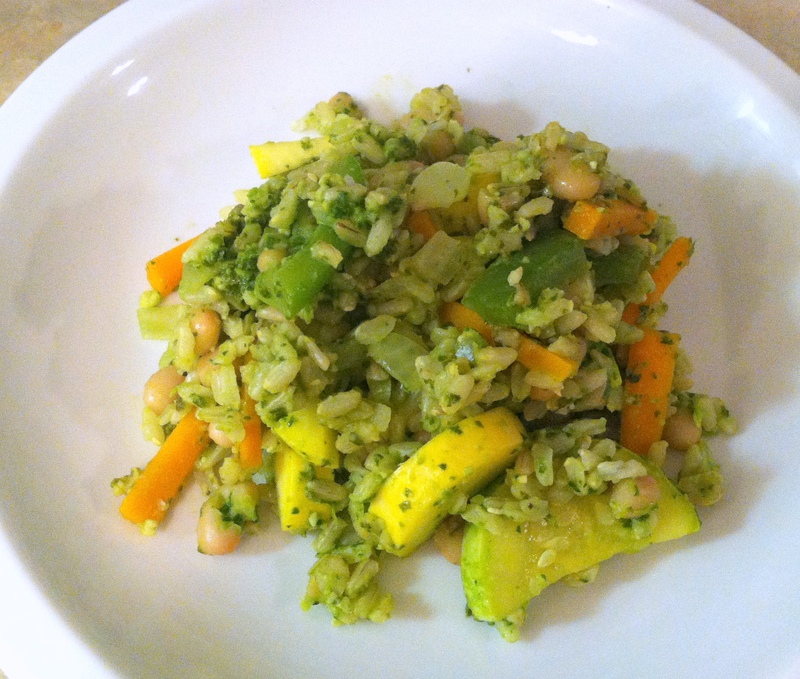 Stir cooked rice into the vegetable mixture and toss to combine well. Taste for seasoning. After the squash halves have cooked for 30 minutes, flip them over on the baking sheet. Brush the flesh lightly with olive oil and sprinkle with cayenne pepper, if using. 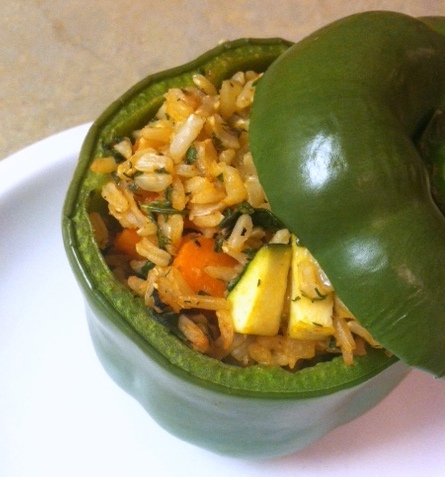 Spoon prepared rice and vegetable filling into the squash generously. 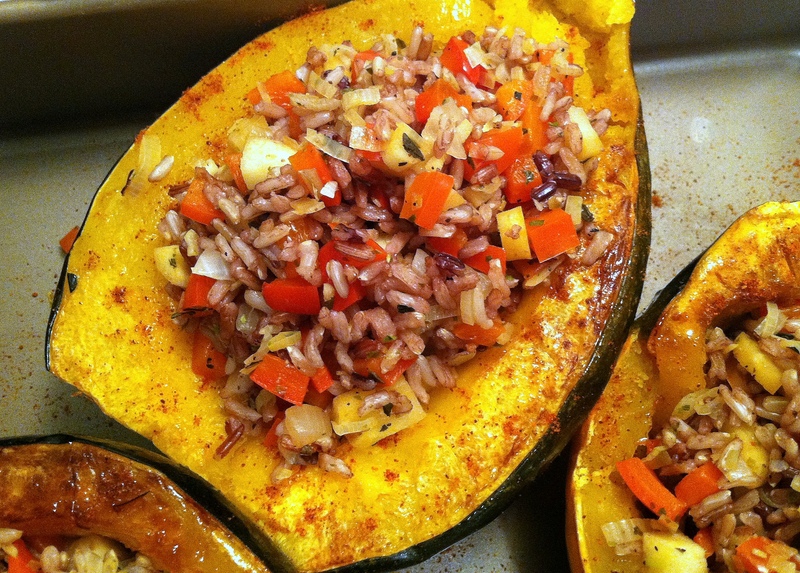 Return filled squash to the oven and bake for an additional 15 minutes. I have something very important to own up to here today. I don’t understand the full-on pumpkin obsession that is happening right now. As a foodie, a blogger, and a huge fan of fall, I feel a little bad about this. I mean, anyone who has browsed through a blogroll lately, walked past a bakery or coffee shop, or even taken a trip to the grocery store has surely seen the pumpkin explosion that is taking over the food world. Pumpkin is a big deal, y’all. And, I just don’t get it. It’s fine, I guess. It’s alright. It’s O.K. But, honestly, it’s not a flavor that I get excited about. I think my pumpkin gene never fully developed. I get excited about other fall flavors, namely apple, ginger, nutmeg, vanilla, and cinnamon. I go nuts for steaming bowls of soup, rich broths, and earthy aromas. 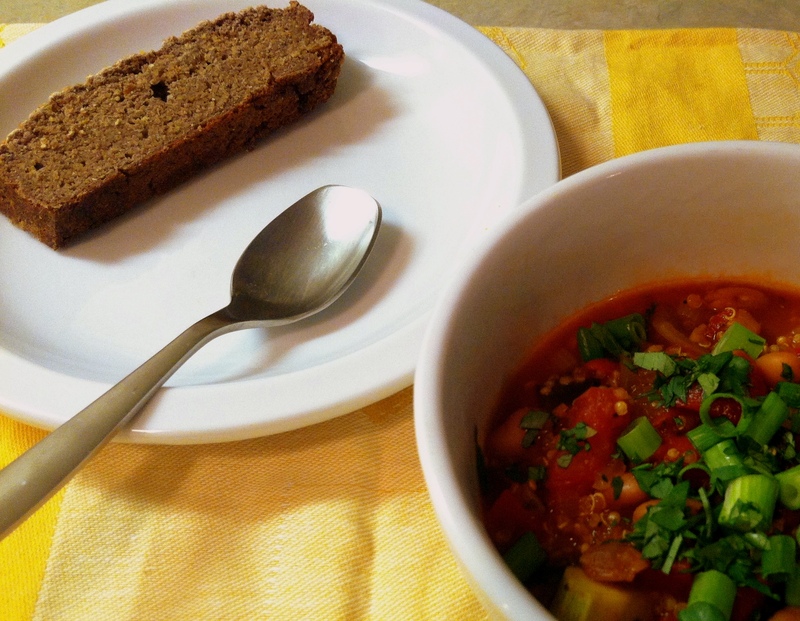 I’m crazy about casseroles, root vegetables, and pots of warm chili. But, pumpkin? I realize I probably just lost a lot of cred with you all, but in the spirit of full disclosure, I felt it needed to be said. In that vain, I hope you enjoy this dish. It is perfect for a chilly autumn evening, eaten in a setting where you feel comfortable and cozy, in the company of those you’re most at home with. And with nary a pumpkin in sight. For those who are disappointed with me and think I’m missing out, don’t worry . . . I’ll probably cave in and bake some pumpkin bread soon. Prepare the potatoes by boiling them in a large pot of salted water until tender, about 15 minutes. When tender, drain and toss into a large bowl (if using a hand mixer/masher) or the bowl of a stand mixer. Add soy milk and Earth Balance and sprinkle with a generous amount of salt and pepper. Mix/mash until soft and creamy. Set aside. Meanwhile, spray a large cast iron skillet or large sauté pan with cooking spray and warm over medium-high heat. Add the onions and cook until they are soft and begin to brown. Add the garlic, carrots, celery, and mushrooms to the skillet and cook, stirring regularly, about 5 minutes longer. 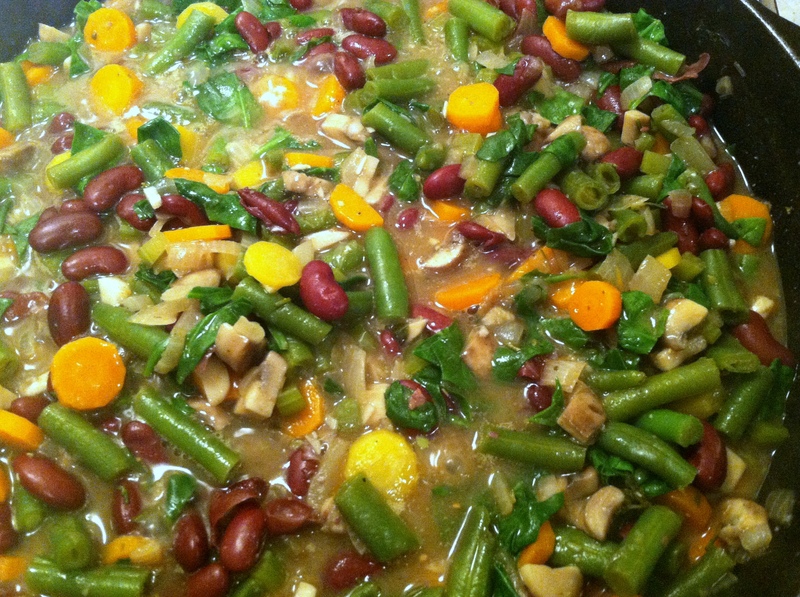 Next, add the vegetable broth, Bragg’s, miso, kidney beans, green beans, and herbs. Bring the broth up to a low boil and then reduce heat. Simmer for 10-15 minutes, or until all vegetables are tender and cooked through. Add the spinach to the skillet and mix well. Let the spinach wilt over the heat for 2-3 minutes. Finally, mix together the corn starch with the 2 tablespoons water until smooth and stir into the skillet. Cook for a few minutes longer, until the sauce has thickened up a bit. Season to taste with salt and pepper. Remove from heat and turn on your broiler to high. 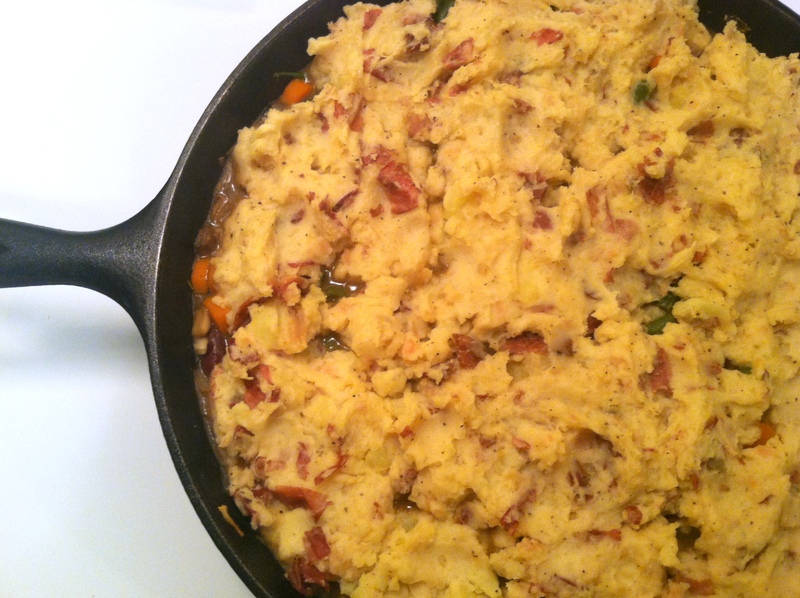 If you used a cast iron skillet, leave the vegetables in the skillet at this point and spoon the mashed potatoes evenly onto the top. If you used another sauté pan, transfer the vegetables into an oven-safe baking dish and then continue on by spooning the mashed potatoes onto the top. Place skillet or dish under the broiler for approximately 5 minutes. Serve immediately. Do you know what victory looks like? If you’re not sure, I’ll show you. Besides finishing my first marathon, I can’t think of another victory I’ve had anytime recently that has felt this sweet. Prior to finding out that I’m gluten-sensitive/intolerant, I ate a lot of bread and bread products. Granted, I was almost exclusively eating whole grain, healthier bread varieties, but bread was a staple in my dietary routine. Since having to give up gluten that has obviously changed. For those of you are about to say, “Wait! There are several gluten-free options available these days – eat those!”, please allow me to remind you that I am also supposed to be avoiding yeast, eggs, and dairy. That eliminates most all the prepared bread and bread dough products I have been able to find in stores or online. This has been one of the most discouraging parts of my gluten-sensitive diagnosis. And, just to be clear, it’s not just about bread. It’s really about having things that have traditionally brought me pleasure and comfort all of a sudden turn into things that harm me. It’s about being excluded from social situations because I can no longer join in with the group in quite the same way. It’s about feeling tense and afraid that I’m going to sick anytime I’m eating something I haven’t prepared with my own hands. It’s about activities (baking/cooking) that I grew so used to turning to for relaxation and joy all of a sudden being fraught with stress and unease. It’s about loss and grief and life changes that are at times complex, sad, empowering, challenging, freeing, and frustrating all at once. I guess what I’m trying to say is that there’s a bigger picture here, People. And all of this is why this bread, this Victory Loaf, left me standing over my kitchen counter shedding a few little tears of joy. I have tried gluten free, yeast free baking a few times since my diagnosis (most of what I baked before was vegan, so that part wasn’t so tricky to adapt to), and it never turned out very well. Some items went straight into the garbage. Others got nibbled at with desperate hopefulness and then found their way to the trash, too. While a couple of items got eaten entirely, it was with some sense of disappointment because they still weren’t quite up to my standards. All of this was done by strictly following recipes. I had lost trust in myself. Not yet feeling any level of confidence with the new flours and gums and grains that have taken over my pantry, I was hesitant to stray at all from recipes and followed them all to sub-par results. I don’t know if I was just selecting bad recipes or if I was executing them poorly (maybe a combination of the two), but I was more than a little discouraged. Until I decided to give myself a chance. Drawing upon what I had learned about the new ingredients available to me and the kitchen skills I have gained over the last few years, I put together my own recipe. I knew that it could fail miserably, but at least I was prepared to do so on my own terms. In fact, it went better in so many ways than any gluten free baking I had done. It was incredible. I made bread that looked like bread, tasted like bread, and exuded nothing less than absolute delight when I took my first bite. I ate my Victory Loaf dry, with Earth Balance*, with jam, with sunflower seed butter, with peanut butter, dipped into soup, and with edamame hummus. I ate it every way that I could. I ate it with joy, with pleasure, with feelings of empowerment, with smiles, with fervor, with delight, and with relief. And every time it felt like a little victory all over again. *This was my favorite pairing. 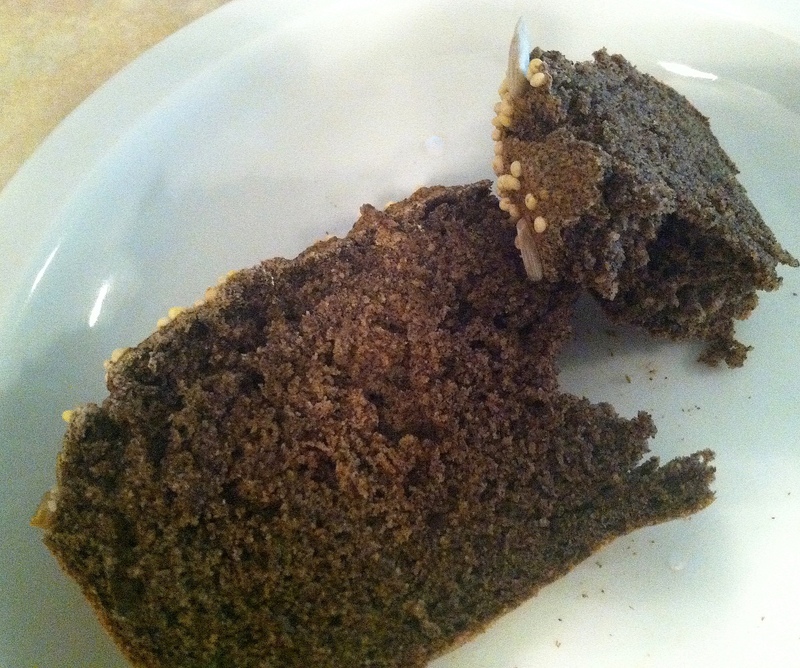 ** Note: You should note that this bread does taste of buckwheat and dark grains. If you’re looking for a soft, white bread, this is nowhere near that. 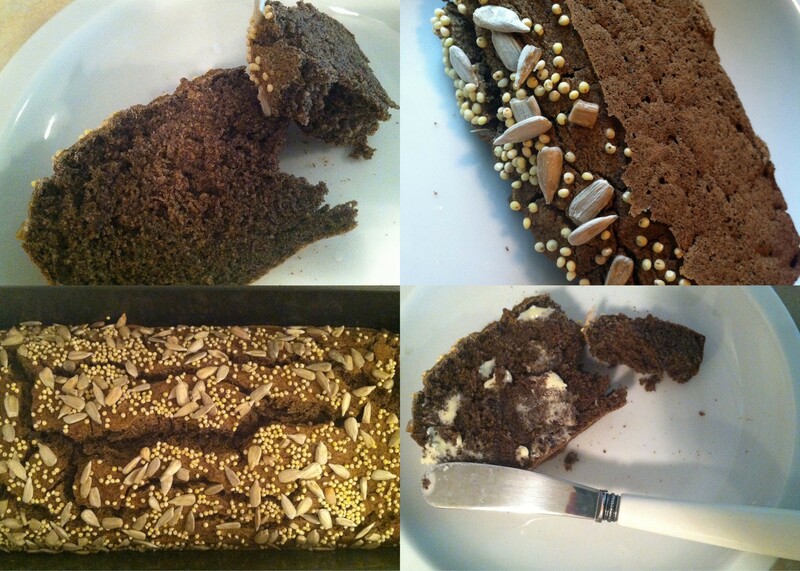 But, if you like whole grains, dark breads, and buckwheat, then this just might work for you. Preheat oven to 350 degrees. Prepare a loaf pan by coating with cooking spray. Combine flours and salt in large mixing bowl and set aside. In a small bowl, combine baking soda with lemon juice and whisk together. It will bubble/foam (this is the yeast replacement and will help create a similar rise effect). Quickly pour into the rest of the batter and stir all ingredients until well incorporated. There is no need to mix aggressively or to knead this dough. Pour batter into loaf pan and gently pick up the pan an inch or two and drop it on the counter in order to settle the dough and get it to level out. 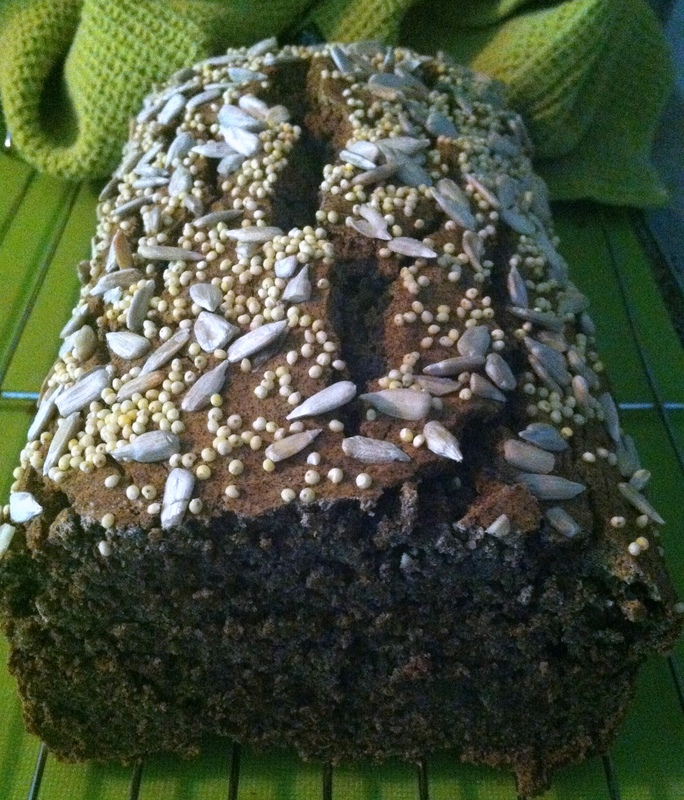 Lastly, combine the sunflower seeds and millet together and sprinkle on top of the batter for a seeded crust. Bake at 350 degrees for 50-60 minutes or until a toothpick inserted into the center comes out clean. Cool in pan for 10 minutes, then remove to a wire rack to cool completely. I have an iron deficiency. Have I mentioned that? One of those pesky side effects of the gluten-damaged system that I am still healing is a lack of nutrient absorption. Combine that with all the running I do and it adds up to a significant lack of iron in my body. Iron deficiency is no joke, as it results in poor oxygen delivery throughout your system and can leave you feeling weak, tired, and cranky. And, really, who wants that? While taking iron supplements is great for getting that very low level up initially, I don’t want to have to rely on supplements forever. I’d prefer to get as many of my nutrients from food as possible, and as such, I offer this dish here – brimming with iron boosting ingredients. Spinach is a favorite of mine, anyway, and I don’t need any extra excuse to eat it. But it certainly is a bonus that is so iron rich. One cup of spinach has just as much iron as 3 ounces of chicken. So, for all my fellow vegetarians and vegans out there, feel free to fire that fact back at those who think iron has to come from animal products. It’s just not so. Continuing to up the iron ante in this dish, I’ve included navy beans (which, seriously, are just like overflowing with the stuff), the bell pepper (one standard green pepper has the same amount of iron as the aforementioned cup of spinach), and pine nuts. To top it all off, I’ve included lemon juice. Why is the lemon juice important, you may ask? Well, besides the fact that it’s delicious, consuming vitamin C (as is found in citrus) with iron increases your body’s absorption rate. So if you’re looking to address an iron deficiency of your own, I highly recommend this meal. It will have you covered, nutritionally speaking, and will certainly be more satisfying than popping a supplement. If your iron levels are just fine and where they’re supposed to be, I still highly recommend this meal. It’s delicious. And nourishing. And simple to prepare. And, did I say delicious? Iron or not, that’s a winning combination. First, prepare the pesto. Place all pesto ingredients, except olive oil, into a food processor and pulse a few times to chop ingredients. Then, let food processor run while you slowly pour in the olive oil. Continue to process until ingredients are well chopped and combined. Set aside. Warm large sauté pan over medium-high heat. Add vegetable broth first, then add onion, pepper, and carrots. Saute vegetables in the broth for 5-7 minutes, until vegetables have softened. 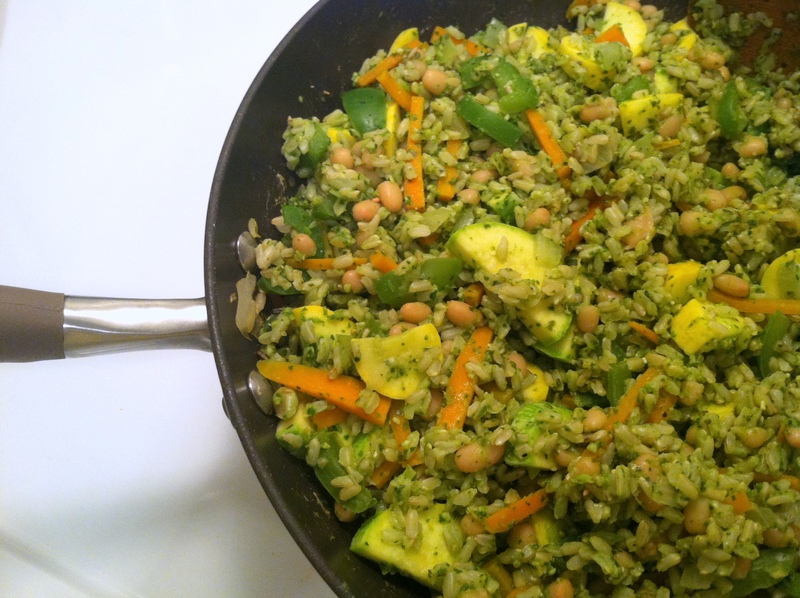 Add beans and zucchini to the pan and continue to cook all ingredients, stirring often, for 5 minutes. Add cooked rice and ½ cup of spinach pesto. Stir all ingredients together and mix well over heat. Let all ingredients cook for 3-4 minutes, to warm everything through and combine. 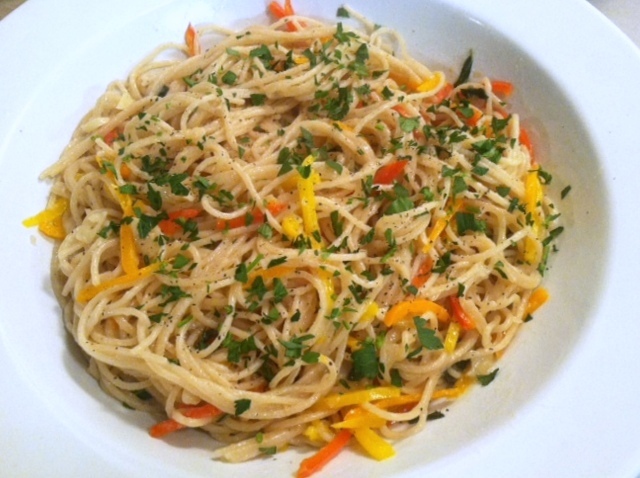 Serve immediately with the remaining ½ cup pesto to be drizzled onto individual servings as desired. It occurred to me the other day that I’ve been at this blogging thing for a bit over a year now. I decided to take a few minutes to look through the content I’ve been putting up and to see which posts have been the most popular. Like any good blog-mom, all my posts are special to me, and it was interesting to see which ones seem to have most resonated with others. Here, in no particular order, are the top contenders. Missed any of them? Click through the links to get caught up and see what they are all about. The Great Accidental Office Experiment (in Veganism) : Good intentions in the office apparently don’t always pay off! Why Wednesdays: Why the Workout ‘Buddy System’ Isn’t For Everyone (And That’s Ok!) 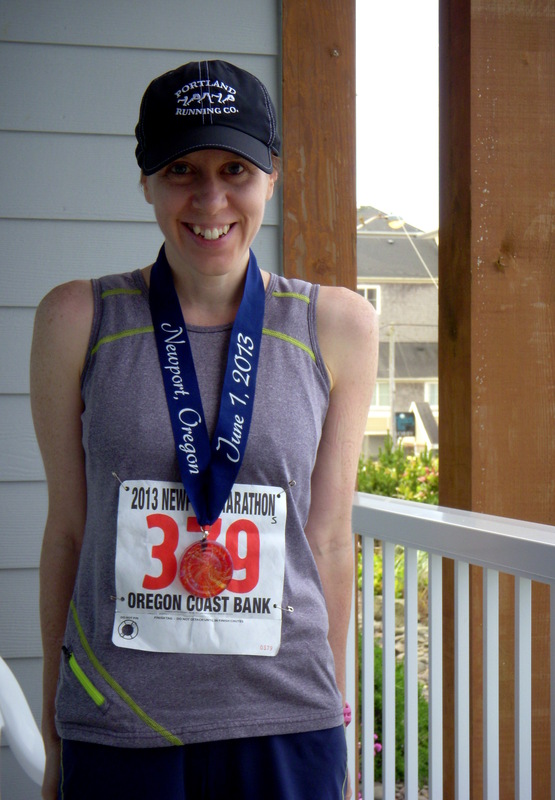 : My thoughts on running and exercising solo. About That Going Gluten-Free Thing . . . 9 Observations from a Newly-Diagnosed Gluten-Sensitive Eater : My personal thoughts and experiences in this still fairly new journey for me. Recipe: Spelt Blueberry Scones (An Offering of Comfort) : One of my personal favorite recipes. 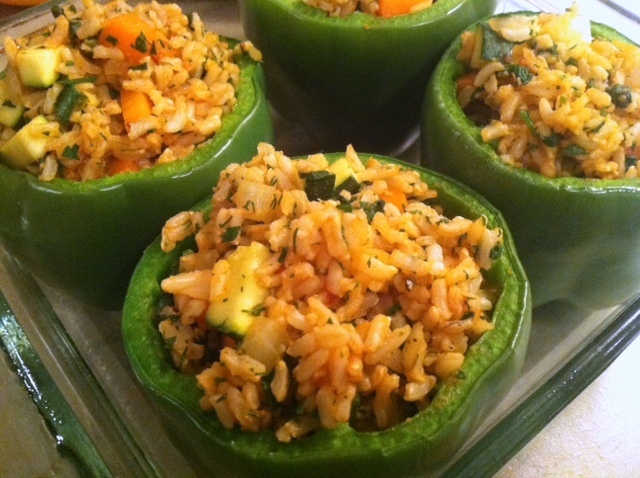 I must find a way to re-create these for my new gluten-free lifestyle! Stripped: The Experience and Exposure of Running My First Marathon : There is simply no other feeling like it. Why Wednesdays: Why Libraries Are Worth Saving : It’s been a while since I wrote this one, but I stand by every word. 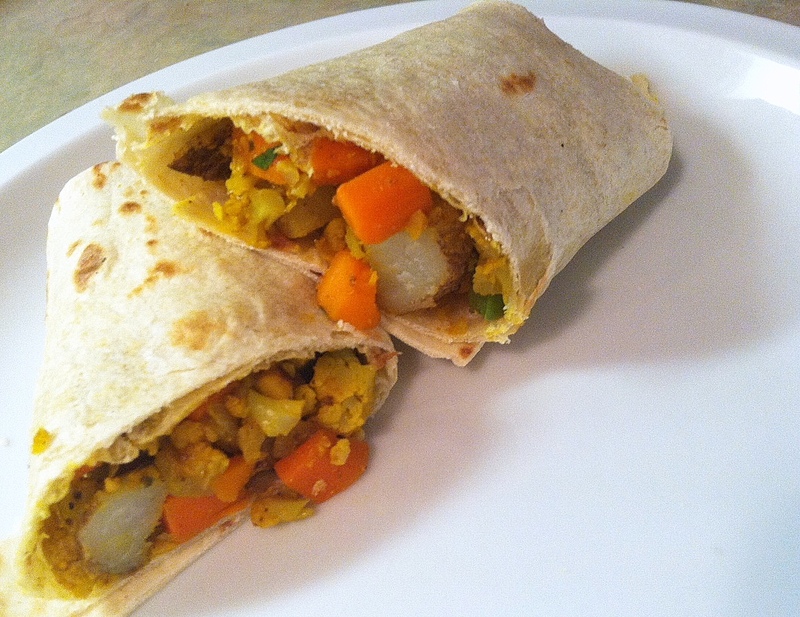 Virtual Vegan Potluck: Yellow Curry Vegetable Stuffed Burritos : So, so tasty. Another one for me to re-create with a gluten free tortilla. I’m pretty sure it can be done! Hooray for a Finished Project: Color Affection Shawl : I’ve been too busy to knit in a long while. I miss it and wearing this shawl makes me miss all that much more! 12 Mistakes Runners Make (as Identified by Running Times) : Oh, Running Times – I love you. Why Creativity Counts: It Connects Us : It does, in so many ways. Let’s Talk About Hills, Shall We? 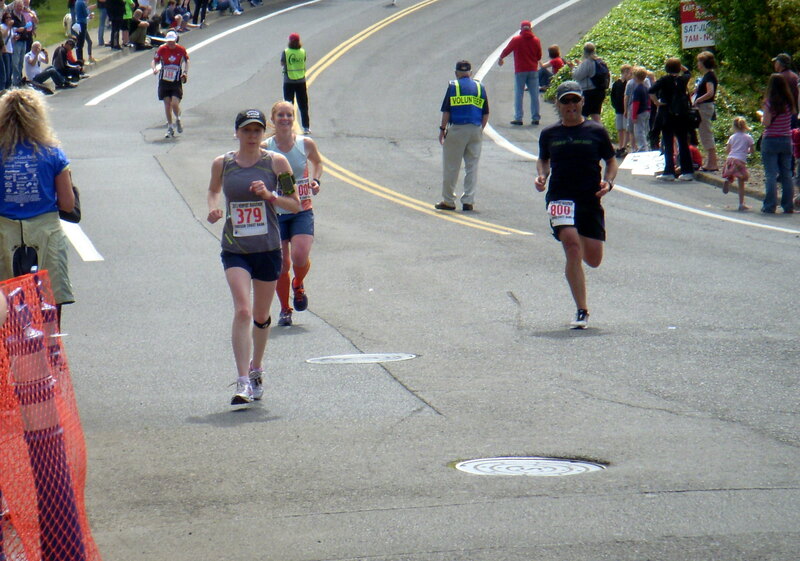 : 6 Tips for Effective Hill Running : I still remind myself of and practice these tips often! Health Truths That I Once Thought Were Shams (Until I Actually Educated Myself) . . . : Oh, I’ve come a long way! 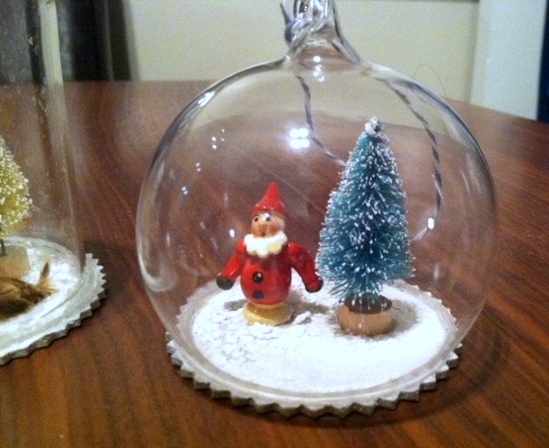 My Hoarded Life + A Recipe for Vegetarian Lasagna Soup : This is a good one. I dare you to try it and not love it! 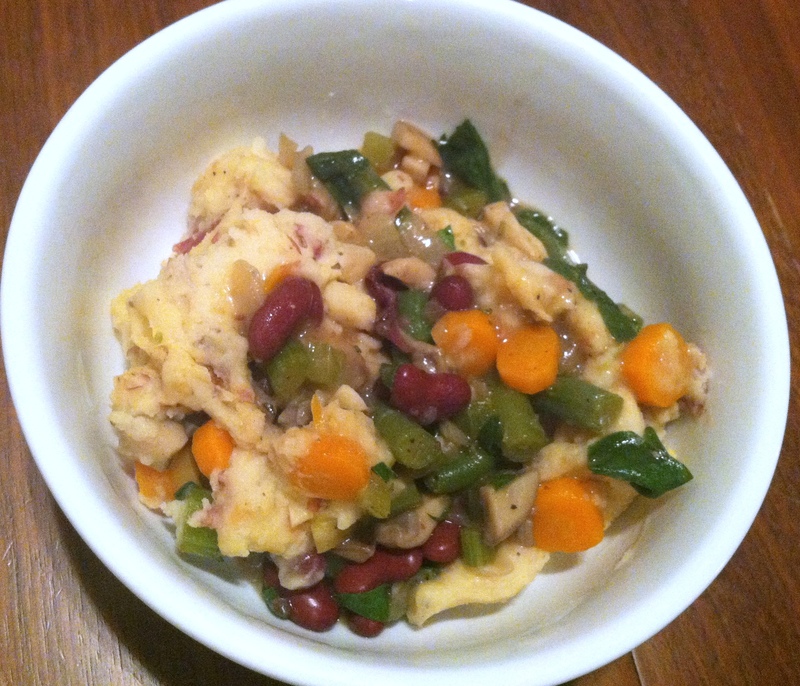 Recipe: A French Influenced Cabbage and Kidney Bean Bake : Such a nice twist on traditional ingredients.